SAF-Holland has introduced a new, hydraulic driven trailer axle. This axle is meant to give support to the tractor unit in heavy terrain under difficult surcomstances. According to US-German component specialist, the new Trak model is supposed to provide transport businesses operating in the construction or waste industry with an alternative to often-costly multi-drive trucks. “The integrated additional drive takes the required performance precisely where it is needed – right to the trailer. Here, the drive axle carries the full axle load and is able to transmit all of the drive torque,” the company said in a media release, revealing that the drive itself has been developed by French company Poclain. According to SAF-Holland, the driver is able to activate the auxiliary drive from the cab at the push of a button. The system then automatically recognises the direction of travel and switches on if speed is reduced due to a lack of traction; otherwise it will be run in stand-by mode – for example if a pre-defined speed is exceeded or the brakes are applied. 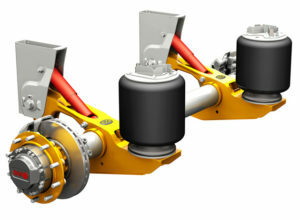 The SAF-Holland Trak axle is fitted with heavy duty shock absorbers and can also be retrofitted. ← MAN: Small facelift, more power and Swedish gearboxes!